The USGA and R&A have drafted more than 100 proposed changes to the Rules of Golf with the goal of simplifying the rules and making them easier to apply. While the amendments will not go into effect until Jan. 1, 2019, they represent what will be the most significant rewrite of the rules book in more than 30 years. Current rule: 1-stroke penalty (with exceptions). Current rule: Weight of the evidence/more likely than not. New rule: The player will be found to be the cause only when it is known or virtually certain (meaning at least 95%) to be the case. Current rule: Drop the ball as near as possible to the estimated spot. New rule: Replace the ball on its estimated spot; if that spot was on, under or against attached natural objects, replace the ball on that spot on, under or against those objects. Current rule: 1-stroke penalty (expect it is a 2-stroke penalty when the accidental deflection relates to the flagstick or the attendant). Current rule: Sometimes the drop is in a specified area, sometimes it is on or as near as possible to a spot or a line. New rule: Drop in a defined relief area. Current rule: The ball must be re-dropped if it rolls to any of the nine specified areas (Rule 20-2c), such as rolling more than 2 club-lengths from where the dropped ball struck the ground. New rule: The ball must come to rest in the relief area where it was dropped, or else the ball must be re-dropped. Current rule: Measured by using 1 or 2 club-lengths (with any length club the player chooses). New rule: The relief area is measured by a fixed distance of 20 inches or 80 inches from the reference point or the reference line; this can readily be measured by using markings on the shaft of a club. Current rule: Stand erect, hold the ball at shoulder height and arm’s length. New rule: The only requirement is for the player to hold the ball above the ground without it touching any growing thing or other natural or artificial object, and let it go so that it falls through the air before coming to rest; to avoid any doubt, it is recommended that the ball be dropped from at least one inch above the ground or any growing thing or object. Current rule: A ball is lost if not found in five minutes. New rule: A ball is lost if not found in three minutes. Current rule: The player must use the original ball when taking free relief (with exceptions); a substituted ball is allowed only when taking penalty relief. New rule: A player may always substitute a ball when taking relief. Current rule: Relief is allowed only in areas cut to fairway height or less, unless a Local Rule has been adopted allowing relief anywhere (except in sand) through the green. New rule: A player may take relief without penalty for an embedded ball anywhere (except in sand) in the "general area" (new term for "through the green"), unless a Local Rule has been adopted restricting relief only to areas cut to fairway height or less. Current rule: The ball is replaced only if a player or outside agency caused it to move; otherwise, the ball is played from its new location. New rule: The ball must always be replaced on its original spot, even if it was blown by the wind or moved for no clear reason. Current rule: A player may only repair ball-marks or old hole plugs on the putting green. New rule: A player may repair almost any damage (including spike marks and animal damage but not including natural imperfections) on the putting green. Current rule: Loss of hole/2-stroke penalty (with exceptions). New rule: No penalty, so long as doing so does not improve the conditions for the player’s stroke. Current rule: Loss of hole/2-stroke penalty if the ball is played from the putting green and hits the unattended flagstick in hole. New rule: No penalty if a ball played from the putting green (or anywhere else) hits the unattended flagstick in hole. Current rule: Relief is allowed only from "water hazards." New rule: Red- and yellow-marked "penalty areas" may now cover areas of desert, jungle, lava rock, etc., in addition to areas of water. Current rule: All water hazards should be marked yellow, except where their location on the course makes it impossible or unreasonable to drop behind the hazard; only when this is the case may these water hazards be marked red as lateral water hazards. New rule: Committees are given the discretion to mark all penalty areas as red so that lateral relief is always allowed (but they may still mark penalty areas as yellow where they consider it appropriate). Current rule: A player is always allowed to take relief from the opposite side of a red-marked lateral water hazard. New rule: A player is no longer allowed to take relief from a red penalty area on the opposite side from where the ball last entered that penalty area, unless the Committee adopts a Local Rule allowing it. 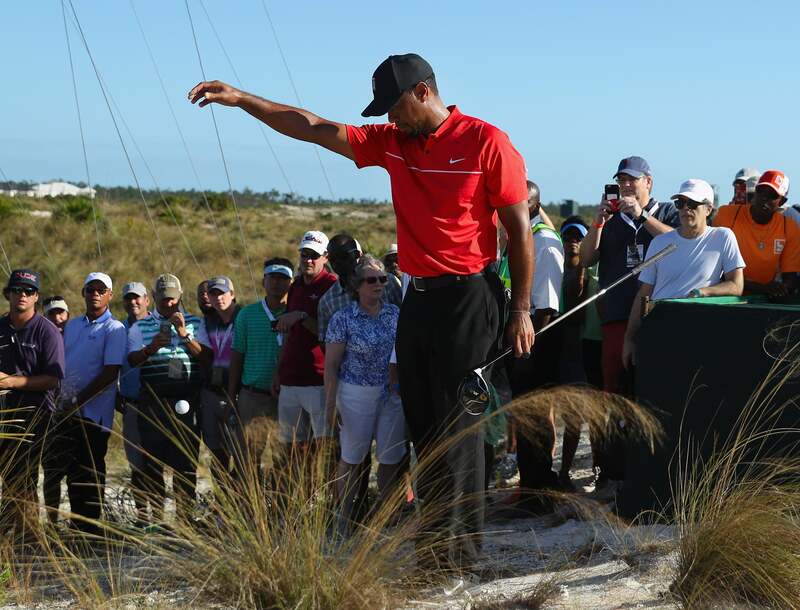 Current rule: Any touching of sand with hand or club results in loss of hole/2-stroke penalty (with exceptions). New rule: No penalty except when a player touches sand (1) with his or her hand or club to test the conditions of the bunker or (2) with the club in the area right behind or in front of the ball, in making a practice swing or in making the backswing for the stroke. Current rule: No relief outside the bunker (other than in playing from where the player’s last stroke was made). Current rule: A player may use the damaged club only if it was damaged in the "normal course of play." New rule: A player may keep using any damaged club, even if the player damaged it in anger. Current rule: A player may replace a damaged club if it is "unfit for play" and was damaged in the "normal course of play." Current rule: DMD use is prohibited, unless a Local Rule has been adopted allowing their use. Current rule: A caddie is allowed to stand on a line behind a player while the player is taking a stance and preparing to play, but must not stand there while the player makes the stroke. New rule: A caddie is not allowed to stand on a line behind a player while the player is taking his or her stance and until stroke is made. Current rule: 1-stroke penalty if done without the player’s specific authorization. New rule: A caddie may lift and replace the player’s ball on the putting green without the player’s specific authorization to do so. Current rule: No recommendations are given. New rule: Recommends that players make each stroke in no more than 40 seconds, and usually in less time. Current rule: No penalty, but the current Rule is written in a way that may imply that playing out of turn is wrong or is not allowed. New rule: No penalty (as today), and "ready golf" is encouraged when it can be done in a safe and responsible way. Other new rules: Simplified dropping rules, allowing more areas to be marked as penalty areas, expanded use of red penalty areas and allowing a player to putt with the flagstick in the hole. Current rule: In standard individual stroke play, players must hole out at every hole; the only recognized alternative forms of stroke play where holing out is not required are Stableford, Par and Bogey. New rule: A new "Maximum Score" form of stroke play is recognized, where a player’s score for a hole is capped at a maximum score (such as double par or triple bogey) that is set by the Committee. Current rule: The Rules set out no standards of conduct, except indirectly in giving Committees discretion to disqualify players for a serious breach of etiquette. New rule: Explains and reinforces the high standards of conduct expected from players and gives a Committee discretion to disqualify players for serious misconduct. Current rule: Committees may disqualify players for a serious breach of etiquette, but are not allowed to impose lesser penalties such as a 1-stroke penalty or a loss of hole/2-stroke penalty. New rule: Committees are given authority to adopt their own code of player conduct and to set penalties for the breach of the standards in that code. Current rule: Before lifting in these cases, the player must announce to another player or the marker that he or she is doing so and allow that person to observe the process. New rule: When a player has good reason to mark and lift a ball to identify it, check for damage or see if it lies in a condition where relief is allowed (such as to see whether it is embedded), the player is no longer required first to announce to another player or his or her marker the intent to do so or to give that person an opportunity to observe the process. Current rule: A player’s judgment is given no particular weight or deference; the Committee decides any issue about the accuracy of the estimation or measurement based on a review of all facts. New rule: When estimating or measuring a spot, point, line, area or distance under a Rule, a player’s reasonable judgment will not be second-guessed based on later evidence (such as video review) if the player did all that could be reasonably expected under the circumstances to make an accurate estimation or measurement.